I kind of have a thing for them. & perfect vintagey cream color. but I already knew just what they would become when I saw them. So for $2.99 each they were coming home with me. a little 'Boo' at Halloween too! for Summer to wind down just yet. *Some of you asked about painting chalkboard paint on the glass. and don't wipe off/repaint too often. Love the little chalkboards! What a great idea. The scrollwork on those frames is so pretty! I love the three put together like that. I am visiting a friend in wisconsin and am heading home today. I plan on hitting every thrift store on the way home. 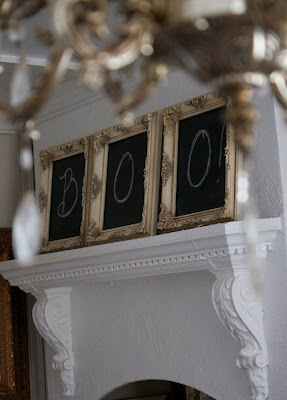 I NEED litle chalkboards like these! Gorgeous. Did you paint onto the glass?????? Those look absolutely darling Courtney! I love them! :-) I'm with you on holding off on my Fall decorating. We are having such lovely warm weather I want to be in the late summer moment rather than hurry to the next season! What a great idea! I love how you did this with fancy frame. So cute. SUCH a great idea! Thank you so much for sharing this. You are right, there are lots of applications/places where these could be used. I love your chalkboards. Elegant and fun at the same time! I love a good ornate frame myself, Courtney! These are just lovely and I love how you've used them! Adorable, I love them! 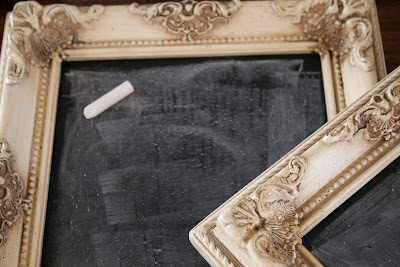 Did you use the chalkboard paint right over the glass? What a wonderful idea...love the BOO! What a great idea! I love them! You done good girl! Courtney they are so adorable!! I love your creativity, helping us all think outside the box! Great deal and I love how you repurposed them! They are really cute! Such a NIFTY THRIFTY idea you had here...LOVE IT!!! 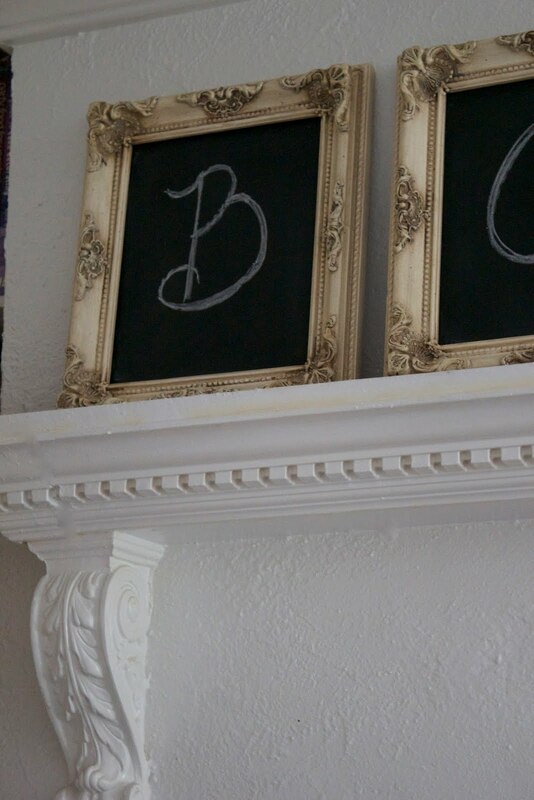 What a charming idea to display 3 matching chalkboards together! Just think of the possibilities...etc,123 abc,do re mi,3 little piggies, and let's not forget "un deux trois"! I'm on the hunt for 3 matching frames for moi. Those frames are super cute. What a great find! LOVe what you did with them too! 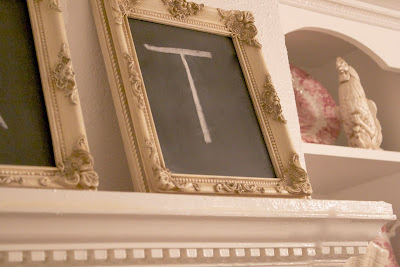 The frames are really beautiful, Courtney and they make cute chalkboards! How nice that you didn't even have to paint them. That is one exceptionally great idea. Really love it and will be on the goodwill prowl for some of my own. What a wonderful idea Courtney!! I LOVE it! Adding to my inspiration file for sure! Very cute. You have inspired me to paint one. 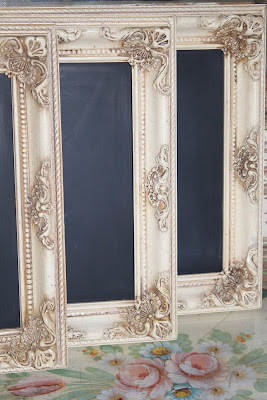 Gorgeous frames! 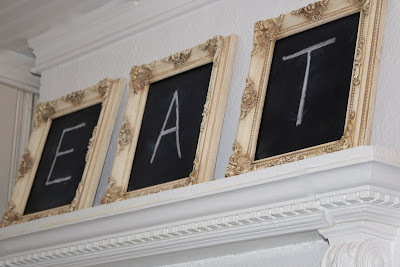 I love that you made them into chalkboards! These are gorgeous i love the idea of using them as art work above a bed or fire place. Love the pretty frames great idea. I can never pass up a sweet lil' frame! Those are really cute! Eventhough it is in the 90's here, I could not resist and started my Fall decorating. I'm enjoying it but hoping for cooler weather soon. Hope all is well! That is just the cutest thing to do! I see a lot of cute frames that need a good coat of paint. Now I just need to do the chalkboard...thinking a menu board in my kitchen. Love it! You got those frames at a great price. I was at the thrift store the other day looking for picture frames. I had to shift through a lot of frames just to find plain wood ones for 99 cents. If they had a picture in them, most were around $15. That's why I question how the thrift stores in my area even get buyers. Most of what is there is complete junk that is way overpriced! Loving what you did to your frames too! I resisted fall as long as I could, but a trip to the craft store got my in the mood. I just decorated my mantel and have started my fall crafting. Love your chalk boards. I am resisting Fall, too. I too am a 'frame junkie' . . . just can't pass a pretty one by! Love what you did with these and all of the possibilities! GREAT chalkboards !! So versatile and the frames are beautiful. Love me some chalkboards, too. Soemtimes, I get lazy and just use black poster board ... I need to get more paint for sure. Have a great day. Those are a steal for $2.99 each! I do love little chalk boards. What a great idea for Halloween! I am getting my Fall decor underway! Definitely copy worthy! So cute, Courtney! I'm so glad you didn't pass up those fabulous frames. What a great idea. I'm resisting fall so far, come tomorrow when it will be downright chilly - maybe not so much resisting! 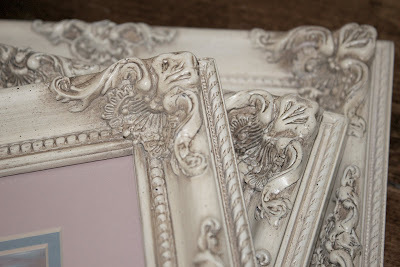 Very pretty - I saw some discarded frames yesterday at the flea market - I should have snapped them up. Next time I will - and follow your lead. Pinned the project - thanks. Sweet! Love those little chalkboards. Not decorating for fall yet either. Don't want to rush things. This is still on my "to do" list. I love these! I just have so many things on that list. It looks beautiful :) The frame is very pretty! Love it! Cute little chalkboards. I wish I could find something so cute! Love them and the price! 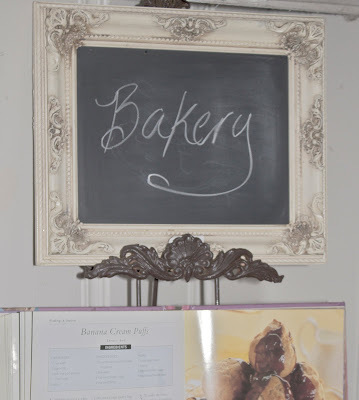 You already know how I adore these little chalkboards! Thanks for linking up Potpourri Friday. You are a real asset to the success of this party and I appreciate you! I will look forward to seeing what you create for next week! Just love all these frames...so pretty. What a nice idea.